Does anybody even consider the Fraser Institute anything but a right-wing cesspool of misinformation and outright lies in 2019? Meh...seems to me that the left, right and centre paradigms are an increasingly vague and even problematic way to view politics. There are plenty of people or institutions who/which hold views that could be considered both left and right at the same time, so how useful is it really to put them on any spectrum? That said 'balance' is good so if the Fraser Institute trends to the "Right" (obviously it certainly does) that's fine IMO as its a counterbalance to hard Left think tanks like the Broadbent and Parkland Institutes respectively, and especially the Canadian Centre for Policy Alternatives which is supported by among others none other than one Naomi Klein (ugh), who I wouldn't trust as far as I could toss her. Thats the wonder of democracy thats lost this last few years, nobody is allowed to challenge or question dogma such as climate, #metoo, and now apparently Maduro. The Fraser Institute is alright. Their methodologies are sounds and have good writers. Certainly right wing, so when there is room for normative statements apply the necessary grain of salt. But I don't think any hard numbers they publish are wrong. The mainstream press are in the Fraser Institutes pocket, so I'll ignore that portion of your post. This is about 3 minutes of looking, I'm sure I could find dozens more. Some misleading, some outright lies ... the point is that the Fraser Institute remains untrustworthy and undependable, as they skew facts and figures regularly in order to fulfil their agenda. That right-wing guys like and defend right-wing institutions is hardly surprising. But you'd think folks would all be clear that when your business is facts and figures, you can't skew them (even slightly) in any direction (left or right) and remain relevant. You’ll be waiting for a while, rjag. Sorry, I was out most of the day. Despite my absence, rjag only had to wait around 9 hours ... not long at all, and certainly not a "while"! What's amazing is not a single politician in Canada actually brings up issues that Canadians support. Things like the high price of groceries for example. High food prices in Canada are 100% because of supply management and no one cares. Gas prices on the west coast are high because not one has the balls to advance refinery development. The majority of Canadians want LESS immigration and ZERO illegal immigration but that issue will not be raised AT ALL in the next campaign. We've all seen what happens to politicians that actually promise to do things people want. They get called racist, sexist bigot homophobes, nazis, and putin puppets. Edited by PraiseKek, 02 February 2019 - 06:37 PM. As you state, because all of those are examples of the MSM have decided are"populist" issues and any politician who raises these issues would be labeled as Trumpesque, in addition to all of those other things. You just drop the T bomb on someone and suddenly the argument is somehow over. Ok good, you fell for the inevitable pitfall. Yes, Tyee, because pointing out that BC’s private schools are in a universe of their own quality of education-wise compared to our public school system is ...propaganda. Uh huh. The rest of your links are equally as rant-like in their disdain for hard truths from the Institute. Here’s another golden gem: “STUPID OR JUST LYING? WHAT’S UP WITH THE FRASER INSTITUTE?” Sorry, Keith, but since you wrote that tearful ode to Kathleen Wynne’s disastrous renewables project in your Environmental Defence Blog (aka Carbon Taxes = good Blog) she’s been booted out of office and Canadians are mocking the federal carbon tax while Rob Ford lobs snowballs at his federal counterparts. Keith and his rant: 0. Fraser Institute: 1. The Fraser Institute cuts through the mumbo jumbo from the intelligentsia and says it like it is. The Tyee and the rest of their ilk can’t handle that, it infuriates them that their dogma is challenged and done so by the greatest of evils: an organization from the left coast. Tyee also has, or had at least back in the day, major links to labor and labor-friendly sources and/or organizations. On many subjects I consider it not much more than a mouth piece/advocate for, shall we say, "NDP-friendly" positions or policies. The Tyee is a bit closer to mainstream but suffers from bias as well...but to quote a 15 year old opinion piece about a report published by the Fraser Institute does not provide an example of the 'outright lies' you claim...its a 15 year old opinion piece about class division in the school system. I'm asking about 'outright lies' as you vociferously claim .... I'm asking with all due respect to you and am not goading you...if you honestly believe that this group is a source of 'outright lies' then there must be quite a few mainstream articles calling them out. And please, Rabble is about as mainstream as Pravda and the Daily Worker. And Rabble, now that’s quality journalism. I’m trying to remember why I have a particular reaction to that rag. It’s the home of Mrs. The Broncos Bus Accident is a Tragedy Only Because The Victims Were White Boys. Remember her and how she tried to social-justice-warrior her way out of one of the most mean-spirited and shameful statements made following one of this country’s biggest tragedies of recent times? Yeah. And Rabble stood by her, they even penned a tearful missive of their own for the way the rest of the country reacted to that nonsense. I know the topic is Justin and all that, but I have a question about his buddy, Gerald Butts, he has a personal net worth of $23million or thereabouts....how does the son of a coal miner and a person who has never worked in the private sector but as a political advisor to McGuinty then CEO of World Wildlife Fund and now principal advisor to JT obtain such wealth? He was the architect of the disastrous green shift in Ontario...he has no street cred apart from political connections....yet he's worth $23million? Why is nobody looking into that? And here are their thoughts on Rabble which, unsurprisingly is way over on the Left - I mean they're partnered with the CCPA for heaven sake so....phhhhhht insofar as impartiality is concerned: check out the Voting stats on the online poll and you'll see overwhelmingly they are rated as being on the "Extreme Left". Heck old Joe Stalin could return from the dead, starve and execute another 25 million people and Rabble would probably cheer him on from the sidelines, so...NO! For what it’s worth, the Tyee does a relatively good job covering issues that require more than a cursory glance from the mainstream press, but where they lose me is when the social justice fight rears its head and suddenly an opportunity to reflect on why [insert topic] face the problems that they do, the issue becomes one of class warfare or corporations. But of course, when the tables are turned, such as the NDP’s re-write of municipal election rules that favour left-leaning municipal candidates over neutral or right-leaning municipal candidates and the subsequent province-wide shift left in the 2018 elections, Tyee and its counterparts have fallen silent. Why? This is a topic literally hand-crafted for them. 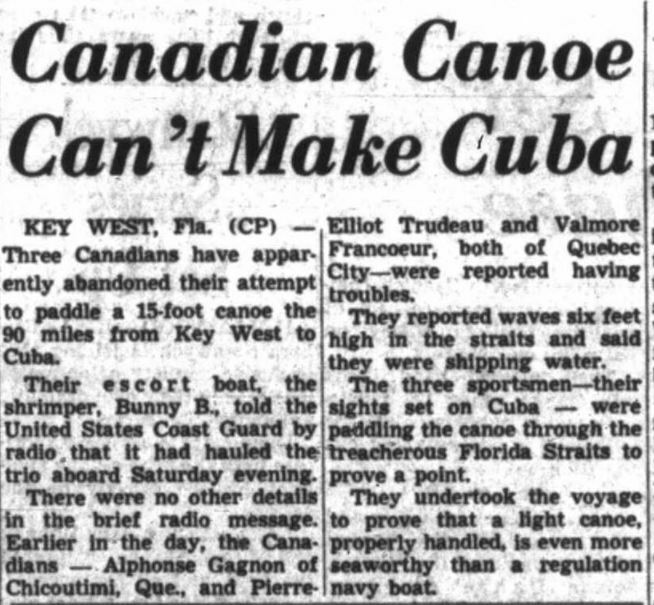 May 1 1960: First mention of Pierre Eliott Trudeau in the Victoria Colonist. Too bad that shrimp boat didn't pull a u-turn instead and head off to the Gulf of Mexico to catch shrimp. Canadian history might've turned out very differently.